Ukraine can deal with its plethora of problems if it follows the economic policies of Adolf Hitler and Franklin Roosevelt and obtains nuclear weapons, says the leader of the Radical Party, who is angling to be appointed the country’s prime minister. The unexpected comparison between the leaders of Nazi Germany and the leader of one of the major nations that defeated him comes from Oleg Lyashko, who heads the ultranationalist Radical Party. “But Germany’s economy was growing because of military contracts,” he added. 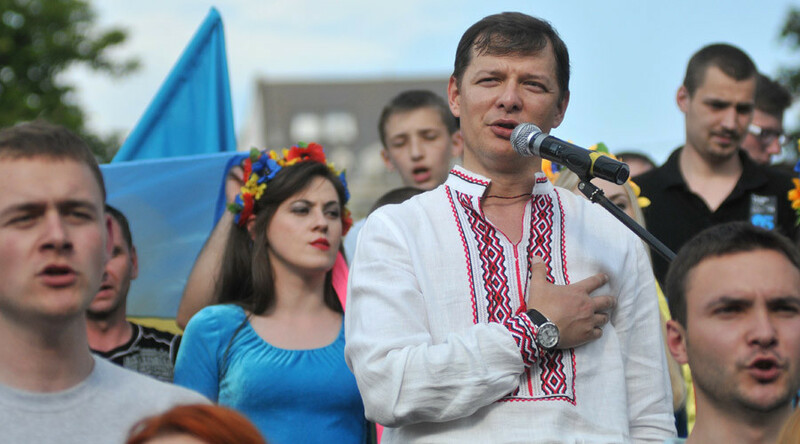 Lyashko is among the more controversial Ukrainian MPs. His party saw a surge of popularity amid the political crisis of 2013-14. It had a single MP – Lyashko himself – in the previous parliament elected in 2012, but now has 21, and its leader claims it would double its strength, if a snap election were called now. The Radical Party was part of the now-defunct ruling coalition, which put forward Prime Minister Arseny Yatsenyuk as head of the Ukrainian government, but has since gone into opposition. Lyashko is convinced that he is better suited to do the job and is pitching his candidacy to potential allies to form a new coalition. “They are all discussing candidacies for the PM’s chair now. [Finance Minister Natali] Yaresko, [Parliament Speaker Vladimir] Groisman, Yatsenyuk, Lyashko. The program is what matters, not the name of the prime minister. We suggest a program. They are discussing names,” he told the newspaper. The program includes some suggestions radical enough to befit the name of Lyashko’s party. One is to arm Ukraine with nuclear weapons. “Ukraine must for the sake of its security recreate its nuclear weapons potential. We have everything we need. We have the scientific expertise, uranium, schematics, the Yuzhmash plant, which can build nuclear missiles,” he said. Lyashko dismissed concerns over nuclear proliferation, which Ukraine’s Western backers are likely to have. “Israel is at odds with the West over developing nuclear weapons. But Israel has national interests,” he said, referring to the nuclear arsenal, which Israel is widely believed to have but neither confirms nor denies exists. Soviet Ukraine hosted a large number of the USSR’s nuclear weapons, but agreed to hand them over after the country’s dissolution. The country was promised by the US, the UK and Russia protection of its borders from a military attack in exchange for that. Kiev considers the secession of Crimea through a referendum and its reunification with Russia an annexation through military force rather than a democratic exercise in self-determination. Some Ukrainian politicians, including Lyashko, say the US and Britain have betrayed Ukraine by not going to war with Russia to return Crimea and that Kiev should never have given up its nuclear weapons. Another quite radical solution suggested by Lyashko is the way he wants to force the country’s oligarchs to pay taxes. “Paying taxes is the key thing. If someone doesn’t – have a firing squad shoot him. Or jail him for life,” he said, in what presumably was a rhetorical exaggeration. Lyashko is no stranger to using force to further his goals. On several occasions in 2014 he and his associates abducted several officials in the discontented east of Ukraine who spoke against the new authorities in Kiev. The abductors insulted, threatened and humiliated their victims in video reports that Lyashko proudly presented to the public after each incident. Despite Lyashko having no legal authority to carry out arrests and treating his victims in a manner that Amnesty International said violated “the rights to fair trial, liberty and security of the person, and the right not to be subjected to torture and other ill-treatment,” the radical MP’s actions didn’t immediately lead to a prosecution. 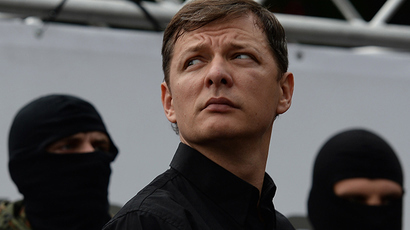 Last August, Lyashko’s fellow Radical Party MP Igor Mosiychuk claimed the he and the party leader were being investigated for one of those abductions, but it was never confirmed by the authorities. Instead the Prosecutor General’s Office had Mosiychuk arrested for bribery, but the case against him stalled. Lyashko poses himself as a champion of the working man, who is not afraid to tell things how they are and doesn’t pull his punches. His party logo features pitchfork, a reference to peasant revolts of times past. His message to the people is that he is going to make Ukraine great, and it bears some similarities to the rhetoric of Donald Trump in the US.